The Division of External Relations offers professional photography services to the GW community. With hundreds of photo shoots in its portfolio, the Division of External Relations can capture the images you need to tell your stories and convey your messages. Whether you want new campus photos for your department, images of your research project, an updated portrait or photos of your event, we are here to help! The photos are the property of the George Washington University. The Division of External Relations reserves the right to use any image for its own purposes. Please provide at least 24 hours notice if your event is cancelled, postponed, or moved to an alternate location. Images used in print must be accompanied by the appropriate credit (photographer name /the George Washington University). For university offices that hire freelance photographers, the Division of External Relations offers a Photo Release Form for photography subjects to sign. 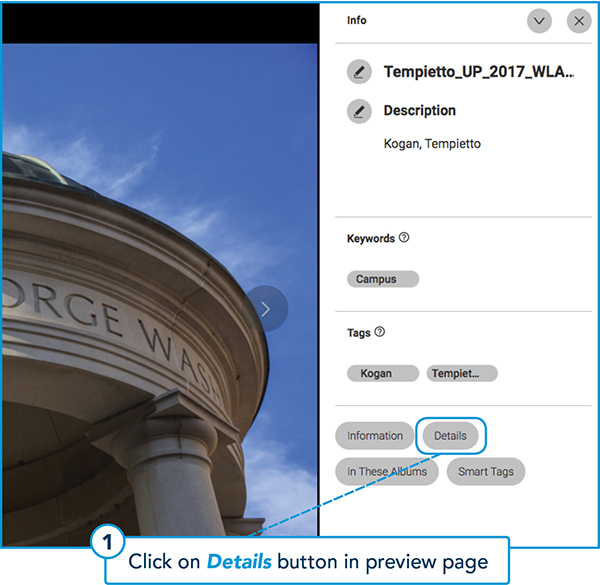 This form authorizes GW to publish the photographs taken for use in university printed publications, university websites, and advertising. **Note: when using GW Photography Gallery images** Images used for editorial purposes in print or web must be accompanied by the appropriate credit (photographer name /the George Washington University). 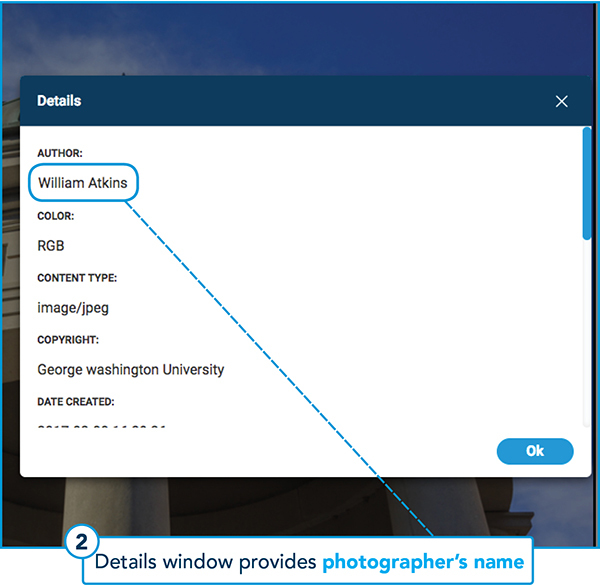 You can locate the photographer’s name under “Author” in the “Details” window. You can do this by either clicking on the "Details" button on the image preview page or clicking on the arrow at the top of the preview page.